Q: Can you give us some details on the purpose of this piece’s creation? : To provide some background on the piece, it was created for a competition. The original development of the poster was used for advertising the German railway stations during the summer months. My connection to Staatliche Bauhochschule Weimar (state school of architecture Weimar) is what lead me to creating this poster. I was initially going to be the head of the sculpture and typography departments but instead I accepted an offer to work within the Bauhaus Dessau. Regardless I created this piece without the intention of commission, but a lot of effort was put into the piece from a technical standpoint. This poster is arguably one of my most well-known pieces, and most trend-setting pieces in the design world. Q: How would you describe your personal style? How do you implement it into your pieces? : My personal style is definitely experimental. It is essentially a mix of different modernist styles, which focus centrally on Bauhaus. This means I gather inspiration from cubism, futurism, and other modern styles, but focus mostly on geometric constructivist styles. The compartmentalization and deconstruction of form, shape, and text is something that I like to explore in all of my pieces. Bauhaus style is shown in essentially all of my work and reflects components of minimalism as well. Q: What areas of design do you specialize in? Does that come across in your work? : Initially I was trained in wood sculpture and carving before focusing on print design. I think that my background in sculpture definitely assists in my overall approach to design. The use of shape and form is a priority in any composition that I create. Many of my works have geometric qualities that encompass the principles of functionalism and simplicity, all revolving around the Bauhaus. The art of sculpture is also heavily grounded in those principles. Working with physical materials obviously causes you to pay attention to the relationship between form and space, usually in a geometric sense. 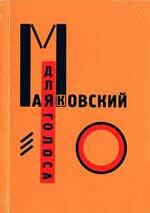 For this piece especially I think it can be seen as a textbook example of what the Bauhaus represents. Structurally, the style is very experimental with the use of shape, text, and primary colour. Q: What is the overall intention of the piece? : For functional reasons, this piece was intended to just simply provide information. However, with the incorporation and consideration of form and shape this piece is a reflection of the Bauhaus. This piece as a whole is a highlight of the movement in and of itself. Bauhaus represents art and industry, and this is reflected through my use of imagery. The lines in the piece lead to the upper center which highlights a man’s face. This face inside a circle of line and colour is the final watermark that symbolizes the movement. The union of man and machine is symbolized through this imagery. Q: How is the treatment of type reflective of the new trends in typography? : Essentially, the shift in art and design is rooted in the Bauhaus philosophies that welcome industry into art. The relationship of elements in art went from “art meets craft” to “art meets machine” as technology advances and industrialization grows. The sans serif typeface used is angular and grotesque. The type is in all caps which adds to the impact I wanted to create. Instead of just incorporating type as a separate element, I thought about it as “one” with every other form in the composition. The shapes and lines on a diagonal plane are in close proximity with the type, along the same plane. This also helps keep everything flowing, allowing you to follow the lines like a map throughout the composition. Q: Addressing popular opinion, do you believe designing in Bauhaus is making a political statement? : Looking at the historical evolution of Bauhaus, it is not necessarily a politically geared movement, but rather it focuses more on a new way of thinking about the everyday. 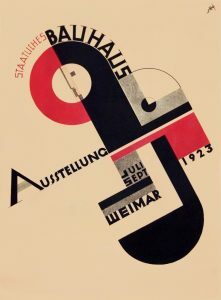 The Weimar was shut down due to political confrontations between the “left” and “right”, but that does not mean that Bauhaus as a school of thought is grounded in political opinion. “Poster for the 1923 Bauhaus Exhibition in Weimar : Bauhaus100.” Bauhaus 100 : Bauhaus100, www.bauhaus100.de/en/past/works/graphics-typography/plakat-zur-bauhaus-ausstellung-in-weimar-1923/. “In Past ShowInnovators of the Art Deco Poster: The Greatest Collection in the World at Omnibus Gallery.” Joost Schmidt | Plakat Zur Bauhaus – Asstellung in Weimar 1923 (1923) | Available for Sale | Artsy, www.artsy.net/artwork/joost-schmidt-plakat-zur-bauhaus-asstellung-in-weimar-1923.